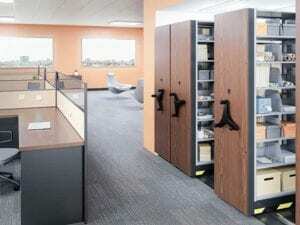 Are you storing and managing a large and active filing system? Constantly running out of space, or losing or misplacing records because of misfiles? High Density Mobile takes your filing problems and turns them into solutions. By installing an open shelf system and placing your files within a “line of sight”, you can use the end tab of the folder to locate your records. Simply turn the label on its side, then put it on the leading edge of the folder. Color coding based on your filing scheme presents visual aides and visual breaks to where sections start and where they end. Misfiles are more readily located and your team will enjoy more productivity as they move effortlessly through a system that is design to hold large volumes of folders. Expanding business means expanding records. High Density Mobile Filing Systems are designed explicitly to expand as your business does. A comprehensive space plan is the complement to a comprehensive records management plan. Look at high density today to create a more productive tomorrow. Call or Contact us today. JB Office Matters is your Expert Filing Consultant, not just a hardware provider. We know filing.